I am a huge fan of anthologies. I am working very hard on a complete collection of Best American Short Stories, Best American Poetry, and a few others in the series. Marvel Comics Presents is one of the few single-issue comics I still grab in back issue form. Heck, I even grab sci fi anthologies, and I don't tend to read much in that genre any more. So when you're reading this, remember that I have a bias towards anthology work, and am therefore far more tolerant than you may be of the sometimes uneven quality of the work contained therein. 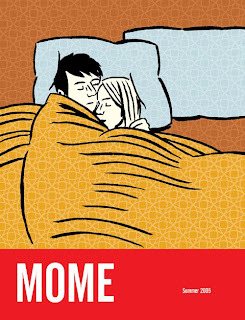 That brings us to MOME, Fantagraphics' anthology series starring Sophie Crumb, Jeffrey Brown, Gabrielle Belle, and others in a recurring quarterly. I had a very hard time finding opinions on MOME, and it's actually the reason I started this comics blog--so that people looking for reviews of things that looked interesting but couldn't find in a store would be able to get a feel for what they might be buying. In my case, the few reviews I found thought the quality was too uneven. I think that's inherently unfair. An anthology series cannot be a winner on every page for every person. That's part of the charm. if you go in expecting it to read like "my favorite author all-stars" then you are liable to be disappointed. If you don't like personal and relationship-based comics, well, then, what the hell are you reading Fantagraphics for?? So, expecting only to find variety and a lot of semi-autobiographical work, I was quite pleased with MOME 1. Bell leads off with "I Feel Nothing", a story of two apartment dwellers who have a mutual attraction but differing approaches to life. Can they form a union? Maybe, and maybe not. Bell's story is strong and her lines are simple and move the story along without being too perfect or extremely abstract. Possibly my favorite of the mix. Kurt Wolfgang, with a lot more squggles than Bell, tells about life just before death, while Jeffrey Brown--quickly becoming an artist I really like--narrates a tale about being artistically blocked and juggling art with work. They could not look more different from each other, but I like the differing styles placed together with a single page comic as a buffer. Perhaps the strangest story is "The Beast" by Anders Nilson, which features a mysterious and very poorly drawn character talking about his philosophy while in chains as different landscape pictures provide the background. At first, you want to side with him, but as things go on, you're just not quite as sure. I read it twice over and I'm still not sure about it. For some, a total turnoff, I'm betting. For me, a great story. "Dance with the Ventures" is a funny story of dumpster diving, a practice we've all done a time or two--admit it! Sophie Crumb gets three short tales, ranging from a random secual encounter to a narrative story to my favorite, about a right-wing Mother who spends all her time obsessing over liberal folks just having a good time living their life. Rounding things out are a Japanese folk tale that felt just a bit out of place with all the realistic stories that came before it and a very strange story about a survivor trying to deal with her grief. There's also an interview with Paul Hornschemeier, who writes one of the multi-part stories. It would have been a better interview had the interviewer not decided to keep harping on the indie comics vs. cape and cowl comics thing. Still, it's always interesting to see what a person is thinking about their creative work. The only slight quibble I have is the multi-part stories, which seem a bit out of place. That might sound strange coming from a person who grew up with monthly comics, but there's a big difference--MOME only comes out roughly quarterly. If I hadn't bought the first 10 MOMEs together, I think I'd be annoyed that I'd have to wait months for the next installment of the story. I think you lose the feel after that long a period of time. I'd rather see them be a feature story running double length or something. All in all, I was very pleased with MOME 1. I look forward to reading more from Crumb and Co in the near future. If you aren't afraid of variety within a theme (personal stories), I think you'll enjoy this quite a bit.